With all the information available about the benefits of inviting women into the boardroom, America barely shows an interest. What does Germany, Australia, Brazil, Iceland, India, Britain and many other countries know about women as leaders that we don't know? Are they better educated, more sophisticated, media-savvy, or political? From my research, I can confirm without a doubt, No! Women own 40% of all the businesses in the U.S.A. and they are growing at a rate of two times faster than businesses as a whole. These 8 million women-owned enterprises have an annual economic impact of nearly $3 trillion. According to World Bank estimates, women own or operate between 25-33% of all private businesses globally. With this kind of financial statement you would think Fortune 500 companies would be promoting women every day as a part of good financial planning. Since this is not the case, let's explore some other reasons why women are still outside looking in. 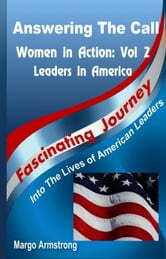 Answering the Call - Women in Action, Vol 2: Leaders in America explores the lives of thirteen American women, their aspirations, education, personal lives, and successes. These women broke the glass ceiling and are helping to usher other women into the "Global female network." Sheryl Sandberg – Chief Operating Officer (COO) Facebook Inc.